A wrong turn down a remote Florida backwoods highway turns into the ride of a lifetime for Emily Weaver, a university librarian, when she mysteriously discovers a manuscript written by Pulitzer Prize-winning author Marjorie Kinnan Rawlings, dated years after the beloved author's death. Emily unwittingly begins a treasure hunt in a world that is as beautiful as it is dangerous, and it is a hunt that could not only change her life, but the landscape of the entire literary world. Is it really possible that the renowned author of The Yearling faked her own death in 1953? Parading through the scrub country in Rawling's seemingly fresh footsteps, Emily must separate fact from fiction as she discovers more than one secret world, opens up her heart to new friendships and challenges, encounters ghosts from the past, and puts her own life in danger to uncover the truth. 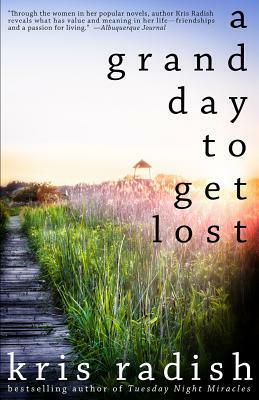 A Grand Day to Get Lost not only resurrects a bold literary icon but also explores the emotional landscape of loss, survival, and forgiveness in a world where anything is possible for those who dare to risk and follow their dreams. Kris Radish is a former journalist and the bestselling author of nine novels and two non-fiction books. She lives near St. Petersburg, Florida where she also co-owns a wine lounge, The Wine Madonna, and hosts book groups from across the country when she's not working on her next novel, and the one after that.